Configuring the appropriate storage system for a particular warehouse or distribution center depends on many factors, including the stored items’ quantities and characteristics, as well as the types of equipment that will be used to move them into and out of storage. For heavy-duty applications, structural steel pallet rack is a specialized type of pallet rack that is made from hot rolled, high resistant structural steel. 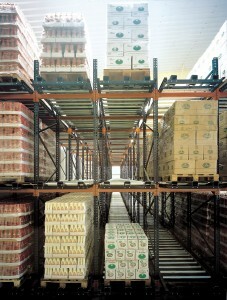 The strength of these heavy-duty pallet racks make them great for high-capacity applications. Uprights are bolted systems and have four-inch centers for placement of the beams (with some manufacturers offering two-inch adjustability for the beams). What’s more, the large footplate is welded to the bottom of the post and has pre-drilled holes for either standard or seismic capacities. With so many options, you need a dealer who can find you exactly what you need – and at the best price. Outsource Equipment offers both new and pre-owned pallet rack and material handling equipment, so there’s always something that’s right for your budget. Here on our site you’ll find descriptions of the various types of warehouse pallet racks for sale, with indications the best applications for which they’re suited. 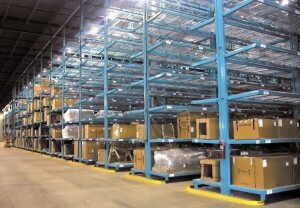 If you’re not sure what type of warehouse racking systems you need, contact us to help you figure it out. Be sure to browse our inventory of warehouse pallet racking for sale today!